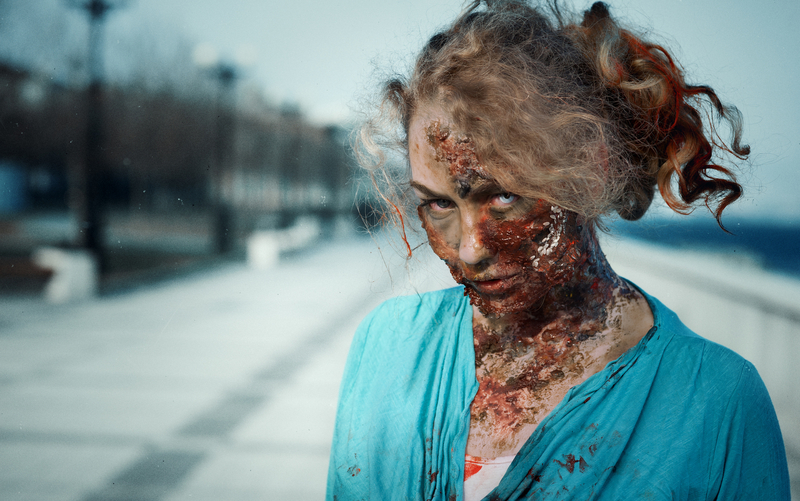 A group of girls were just portraying zombies outside a theater in Park City, Utah when fantasy turned into reality and ironically they became the victims of true to life horror when a man attacked them. The violent attack happened on September 22 just outside the Egyptian Theatre at 328 Main Street in Park City. According to a statement of probable cause, one of the girls said the man threatened her, saying: “if you touch my daughter I will punch you.” But the man made good on his threat and went on to punch the girl in the face. Another teen said she witnessed the man push two girls down the stairs before turning to her and pushing her, too. Another girl said the man made another threat to their group and said, “if any of you touch me I’ll F— you up.” and then violently went on to grab her by the neck and push her down the stairs. The attacker has been identified as 56-year-old Drew Stephen Hyde. He was booked into jail and faces five counts of child abuse involving physical injury as a class A misdemeanor. All five victims were with Odyssey Thriller and were just portraying zombies outside of the Egyptian Theatre when the attack took place. The victims were immediately checked out by medical personnel, and they were found to have suffered minor injuries. It is not clear why Hyde acted the way he did if he was provoked in any way or his child was touched inappropriately, or the girls were just so effective in their portrayal they scared Hyde out of his wits. Anyhow, the violence is unjustified. How do you know it wasnt justified? Maybe they scared him and his daughter and he snapped. girls will say anything to cover their asses. Im sure the community outrage will help with his fair trial. This just seems way more slanted than usual. "Anyhow, the violence is unjustified." Unless they were a gang of teens on meth. How did he know they were actors? Stupidity on the theater's part. Also, this is not a "news" article. It is mostly your opinion. Not good for journalism. Remember not too long ago when teens and adults were dressing as clowns and terrorizing people. Police started arresting them for it and advised people not to do it because someone may defend themselves. My guess, these girls were bored with the street scene as people knew they were there. They decided the dark alley looked more promising for a scare or two. Bad choice because a protective father and his family were "just" walking through to enjoy an evening before being accosted by a group of unidentified people pretending to be zombies. Egyptian Theater may want to hire an attorney for their upcoming civil suit and settlement. This guy's criminal charges will be dropped as he has a right to defend himself and family from others in an alley. Prosecutor has no case here and the defense lawyer will prevail if it went that far.